I’m going to kick off our formal evaluation of compass accuracy with the a design that has been in continuous use for over 60 years and has seen use by millions of individuals. 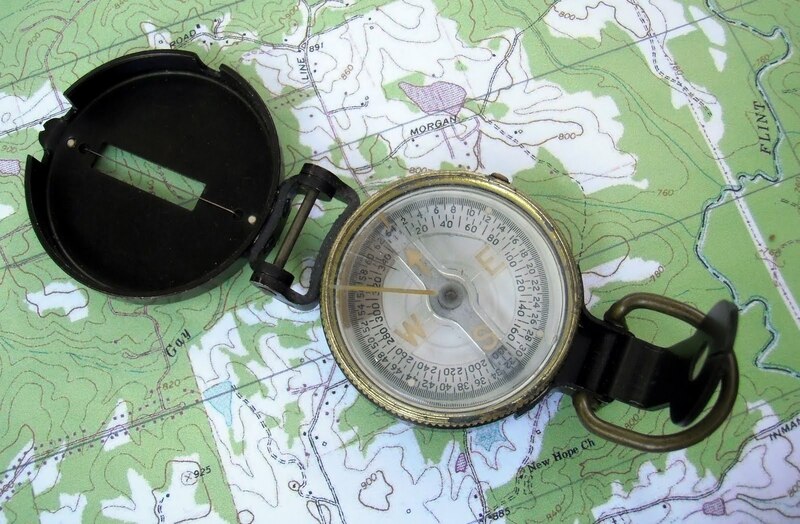 It is perhaps the most tested compass design in history, with documented use in jungle, desert, woodland and arctic environments around the world. It is tried and true and is one of my favorite compass designs. It is the US Army’s Model 1950 lensatic compass. The M1950 compass is a design born of war. It’s predecessor, the M1938 lensatic compass, was developed and adopted just as WWII opened. It was a good design that was easy to manufacture. 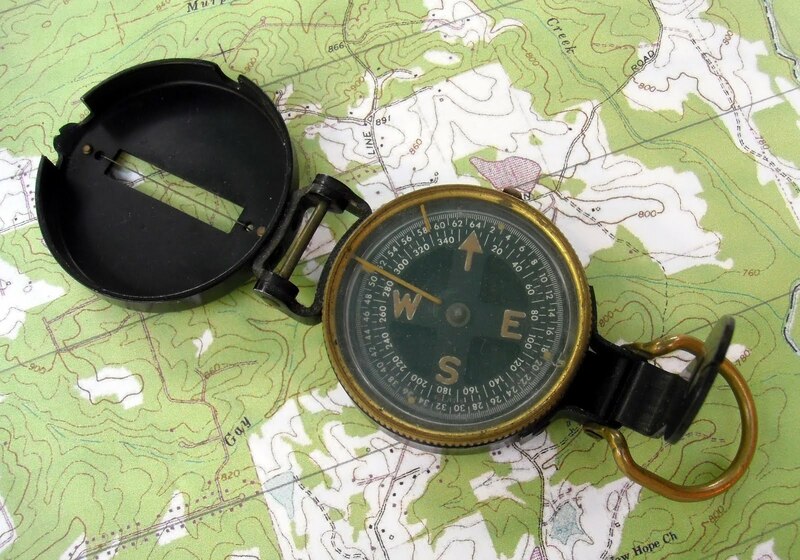 Equally important, the adoption of the M1938 compass allowed the Army to standardize land navigation training, simplify it and teach it to the millions of young men who were being drafted into the Army and Marines. 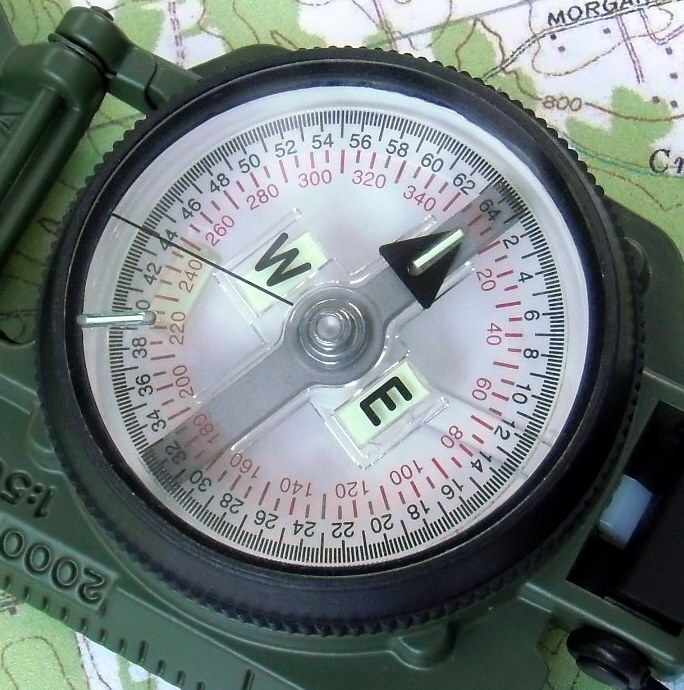 The experiences of war taught the Army a few things about compass design. First, it proved that the lensatic compass design was a good one. It was accurate, reliable and versatile. With its compass card graduated in both degrees and mils it was usable by the both infantry and artillery. The military liked the basic design and stuck with it. However, wartime experience also highlighted some shortcomings in the M1938 design. It was somewhat fragile. While not a toy, the M1938 was lightly built – just two stamped aluminum cups fitted together to form the compass bowl and lid. It had no mechanism to lift the compass card off of the the pivot needle when the compass was closed. A lot of compasses were damaged when the the tip of the pivot needle gouged or cracked the pivot jewel through rough handling. But perhaps the biggest shortcoming of the M1938 compass is that it had no dampening mechanism. This meant that the compass card would swing wildly and would take a good number of seconds to settle down to the point where the Soldier could get an accurate reading. There were some versions of the M1938, those manufactured by the W. E. Gurley Company (a leading manufacturer of surveying instruments), that included a needle lift mechanism that with practice could be used to brake or slow the compass card oscillations. However, the vast majority of compasses were manufactured by the Superior Magneto Corporation and did not include this needle lift mechanism. After WWII the Army incorporated induction dampening into the M1938 design. Induction dampening is a beautifully simple concept. It takes advantage of the inductive magnetic field generated between a swinging compass needle and a highly conductive but non-magnetic alloy like copper. When a magnetic needle (or bar) is placed inside a cup made of copper and the needle swings (oscillates) that movement causes a slight magnetic eddy current to form. When the needle swings to the left the eddy current pulls it to the right. When it swings to the right the eddy current pulls it to the left. The eddy current is self-canceling; as the needle oscillations decrease the eddy current strength decreases and very quickly the needle settles down and is aligned with magnetic north. Simple, elegant and effective. a copper cup that forms part of the induction dampening system. Marine Compass Company out of Pembroke, Massachusetts. However, by the late 1940s the Army decided it was time for a whole new design. The Army took the best functional elements of the M1938 compass – the lensatic sighting design and the combined degree and mil scales on the compass card – added induction dampening, a needle lift device, a much larger sighting lens and a larger thumb loop and placed it all in a beefed-up waterproof aluminum housing. The resulting compass was designated the M1950 Lensatic Compass. It is a rugged, versatile device that has remained in use with the US military for over 60 years, pretty much as originally designed. is almost 60 years old! Fast forward almost 60 years and the same compass design is still in use by the US military, and it doesn’t look like they have plans to switch designs any time soon. the US military for over 10 years. Since 1950 this compass has been produced by a number of manufacturers, including the Marine Compass Company, Jay-Bee, Union Instrument, Cammenga and even Lionel (yes, the train people!). However, it seems that the single biggest manufacturer of M1950 compasses was Stocker & Yale out of Massachusetts. I don’t have any specific production numbers for these compass manufacturers so my claim is based solely on personal observation. Based on the compasses I was issued in the Army and what I see for sale on auction sites or in surplus stores it appears that Stocker & Yale had the highest production numbers. Now, the US military doesn’t just turn to a manufacturer and say “Make it!” Like all things military there are clearly defined specifications. It doesn’t matter if you are building an aircraft carrier or a handheld compass, there must be clearly spelled out specifications! So it is with the M1950 Lensatic Compass. Today’s compasses are built and tested in accordance with the DOD military performance specification known as MIL-PRF-10436N (Performance Specification, Compass, Magnetic, Unmounted, Lensatic, Luminous, 5 Degree and 20 Mil Graduations, With Carrying Case). The discussion of this performance document is important because the M1950 compass is the only US produced handheld compass I am aware of that is built to a specific performance specification, and is regularly evaluated against this performance specification by an outside agency. If any test batch of compasses fails the evaluation the devices never make it out of the factory. The M1950 is a purpose-built device designed to meet a clearly laid out specification not just for accuracy but for shock resistance, water resistance, illumination, thermal shock, durability and service life. Manufacturers of other compasses may have their own internal standards (and many are quite good), but the M1950 is the only handheld compass you can buy that is designed to meet demanding military standards and is rigorously tested by an independent agency to ensure it meets those standards. So just how good is the M1950 compass in the real world? Pretty damned good! The 58-year old example I show above that was made by the Marine Compass Co. is still perfectly serviceable and would probably meet all of today’s performance specifications for accuracy and durability. I have other examples in my collection that have clearly seen hard use, some with broken components or cracked dials, but they still provide reliable and accurate readings. The M1950 compass is a device that is hard to kill. I believe that the key to the M1950’s ruggedness is the fact that is it not a liquid dampened design. Liquid dampening (where the compass needle or card is suspended in fluid to reduce oscillation) is very effective but is a more fragile design than the induction dampening used in the M1950. With the liquid filled design the compass needle or card must be sealed inside a leak proof capsule*. The problem is, compass manufacturers have not yet figured out how to make a leak proof capsule. I have over 15 liquid filled compasses in my personal collection. About half have air bubbles inside the capsule, a sure indicator that the fluid is leaking. How accurate is the M1950 compass? 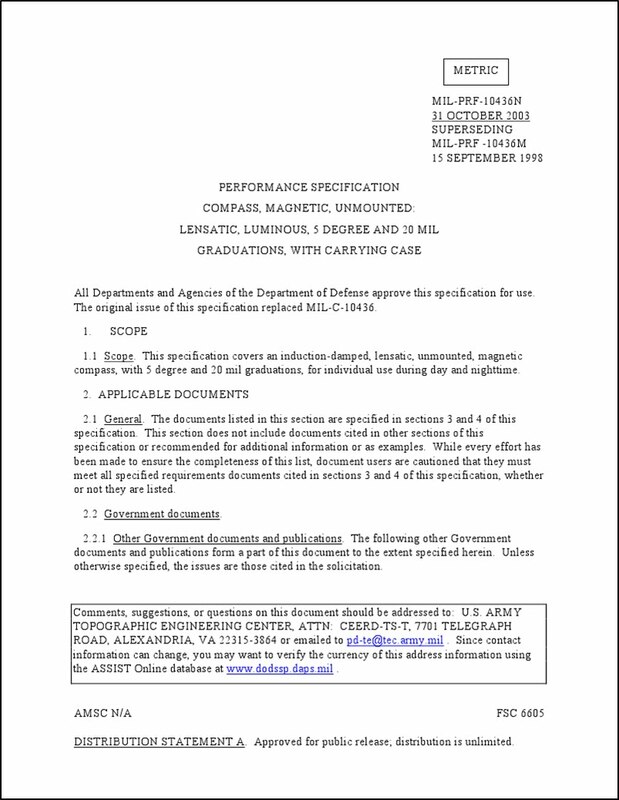 Every M1950 I’ve used (and after a 23 year Army career I’ve used a lot of them) has at least met, and many exceeded, the performance specification for accuracy. Now this is where I need to come clean on my evaluation of the M1950. It is not the most precise handheld compass available. This compass’ biggest design limitation is that the compass card is divided into only 5 degree increments; pretty coarse even for handheld use. Compass card of the M1950 compass. ring (in black) is set out on mils (6400 mils to a circle). This means that the average user, the common Soldier, can only discern and measure to half of that increment – 2.5 degrees. 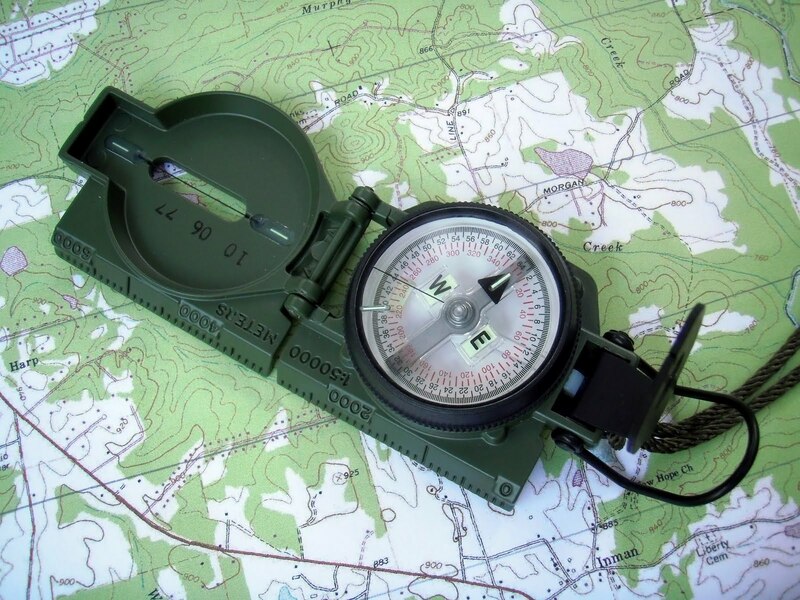 Experienced users – mostly infantry and artillery Soldiers who use a compass regularly – can frequently get accurate readings to between 1.5 – 2.0 degrees. But to be realistic, 2.5 degrees is about as good as anyone can expect to get with this compass card layout. The M1950 compass card design is a compromise. The military needed to include a mils scale for use by the Field Artillery. Mils offer more discreet division of the circle (a mil is 1/6400th of a circle), allowing for more precise azimuth determination – very important when you are calling in artillery strikes on distant targets. To accommodate the mils scale it needed to be printed at the outer edge of the compass card, leaving less space to print the degrees scale. This results in a coarse, less precise degree scale. The military performance specification states that the compass must be accurate to within 40 mils. Since one degree = 17.8 mils, 40 mils is slightly less than 2.5 degrees. Let’s round up and call it 2.5. 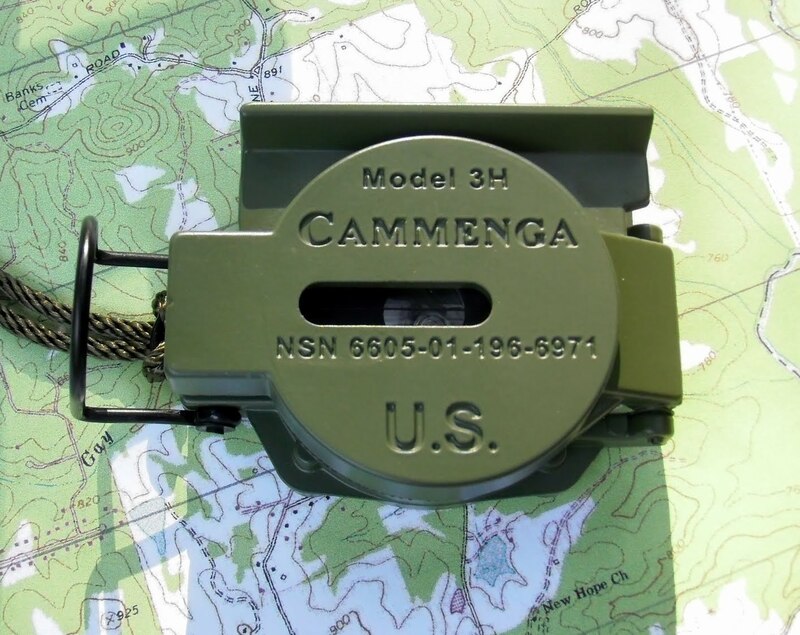 I have tested my 2010 production Cammenga compass at a known azimuth station and found it to be accurate to just over 2 degrees when used in the handheld mode and sighting on targets up to 150 feet away. This compass very easily meets the performance specification. 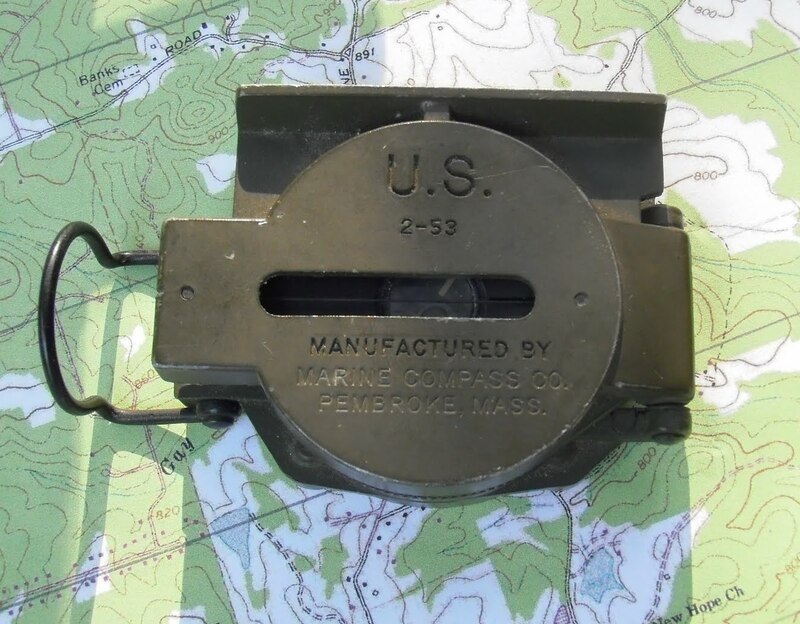 Before I wrap up this blog post I need to add that the M1950 compass was merely one component of a land navigation system that the Army developed and adopted at the end of WWII. 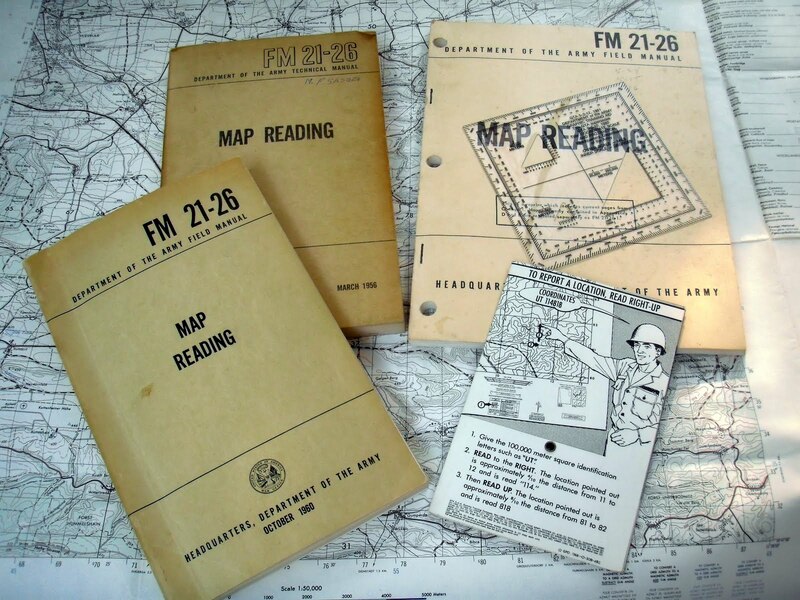 Along with the M1950 compass came dramatic changes in how the Army mapped the world, developing standardized maps with overprinted grids (the Military Grid Reference System) and plotting tools. It was all designed to simplify land navigation for the common Soldier, and is was so successful that the methodology is still in use today. extraordinarily successful program that is still used today. Let’s wrap this up. 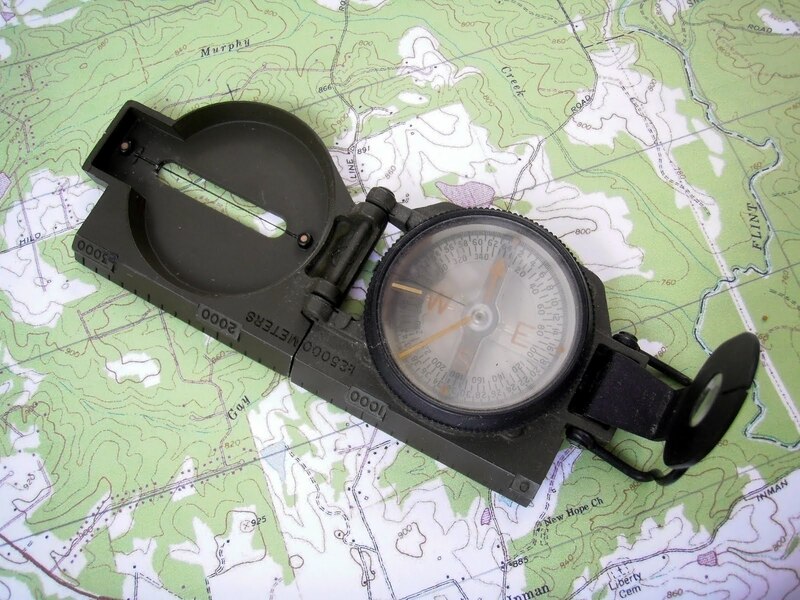 Here is my bottom line – I consider the the M1950 compass to be the best general purpose handheld compass available. It is a proven design that is built and tested to exacting standards. They are readily available new or used to civilians and are one of the best examples of trickle-down military technology I’ve seen. If you spend any time in the outdoors you need a compass. You might as well get the best available. Get a M1950 Lensatic Compass. *One compass manufacturer, K&R out of Germany, claims to make a leak proof liquid capsule but I don’t think they have been on the market long enough to have proven the claim. This entry was posted in compass, Military, Tools and tagged lensatic compass by Brian Haren. Bookmark the permalink. Although it is possible to replace the tritium capsules in devices I'm not sure it is worth the cost in the case of the Cammenga. I'd recommend you contact Cammenga directly and ask, and we'd all be interested to know their answer! Hi Brian, Nice write up! I am going to get a Cammenga (Black) for sure. Do you know if Cammenga can “refill” the tritium once it wears off? Anyway, also the postscript you have on the K&R compasses out of Germany. Well, they have been in the business since the 1920's. But what I am not sure is if they'll put a warranty behind their products. THeir website does not say. But I suppose one can trust german engineering. My azimuth test station is one I set up on the south side of Hartsfield Airport in Atlanta. My co-workers stop and stare when they see me out peering through compasses, turning this way and that. It's great fun! Hi Brian! Tim gave me a M1950 Lensatic Compass a couple of months ago. Great piece of equipment. He told me it was one he used on one of his deployments to Iraq, Made by Stocker & Yale in 8/89. I've checked it out using three azimuth points here in Troy. I'm fortunate in that there is a lot of ongoing survey activity being conducted for the maintenance of the levy system; built in response to the 1913 flood. There are points all over the place that are checked by the Miami Conservancy District on a periodic basis. I can start with the first one two blocks away. From there I have my choice of four to select from. All but one of these will allow me to sight in another three. they are not 90 deg. but sufficient enough from an angular standpoint to check the accuracy. Lots of fun and the neighborhood thinks I'm nuts!